Happy New Gardening Year! For many of us we have been blown in 2018 with high winds and rainstorms. Once we dare venture out the first job for January will be a good tidy up. Let's see what other gardening jobs we can be doing this month. Recycle your Christmas tree – The best way to recycle a cut tree is to shred it and then use the woodchip later in the year for mulch. If you don't have access to a shredder you could let it rot down naturally but very slowly in a dedicated wildlife patch in your garden. Wildlife will love this bit of cover. Create an instant snowdrop display – Although snowdrops are bulbs they are best planted while they are still growing and 'in the green'. For an impressive display plant several in clumps. Sort your seeds out – Most keen gardeners will have far too many seed packets than they can possibly ever plant. Sort out any which are out of date, ones which you know you will never sow and possibilities for this year. Get your propagator ready – Once your seeds are sorted some of them will benefit from a long growing season so will need a little help. Check your propagator is still working and give it a good clean so there is no cross contamination from previous seedlings. Warm up soil – With so much snow and frost around recently the soil will be at its coldest. Help the soil warm up by placing plastic sheets or fleece on the ground. Make sure it is weighed down properly or the next gust of wind will see it flying over the fence. 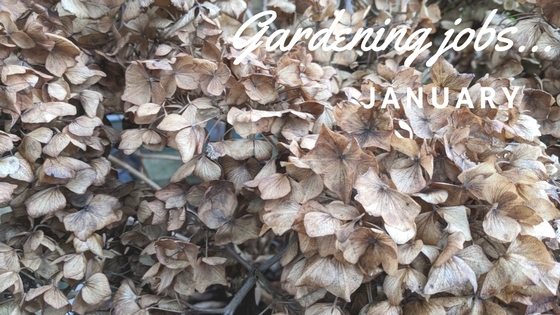 What are your gardening plans for January? Have you starting planning for 2018? Great list! We finally got our much needed first rain of the season. I need to do a fair bit of weeding, re-pot a few plants, and add much needed mulch to some areas of the garden.